According to a World Energy Council study,3 global demand for primary energy is expected to increase by between 27% and 61% by 2050. Climate change is expected to lead to changes in a range of climatic variables, most notably temperature levels. Since electricity demand is closely influenced by temperature, there is likely to be an impact on power demand patterns. The magnitude of the potential impact of future climate changes on electricity demand will depend on patterns in the power use, as well as long-term socio-economic trends. Consumption patterns, together with aging and urbanization in some countries seem to have bigger implications for health and the reduction of carbon emissions than the total number of people in the world.5 As developing and newly industrialized countries improve their standards of living, their use of air conditioning and other weather-dependent consumption will likely increase their sensitivity to climate change.6 On the other hand, reducing consumption and achieving more sustainable lifestyles in rich countries will likely represent the most effective way to reduce carbon emissions. Energy markets have a substantial amount of economic potential for improving energy efficiency, but many cost-effective energy-efficiency measures are not being deployed. Hirst and Brown8 noted that only half of the economic potential for US energy efficiency is likely to be realized over the next 20 years. addressing carbon management issues that involve separation, capture, sequestration and conversion to useful products. In view of the second point, a conventional model for power systems is widely seen as untenable and Smart Grid initiatives have been launched worldwide as a response to these developments. The idea of the Smart Grid is “computerizing” the power grid. The Smart Grid of the future should act much more like an interactive web, or “energy Internet,” with two-way communication, multi-directional power flow, remote-control automation technology, and real-time view of operations. Smart grid technologies offer great potential for reduction of emissions. The emission benefits of the Smart Grid are difficult to quantify because they depend on how enabling technologies function within the system. Estimates in the literature vary both in magnitude and in source of emission abatement: electric vehicles (EVs) displacing oil consumption, price transparency stimulating conservation, enhanced energy efficiency reducing energy consumption, or renewable energy displacing conventional fuels through increased system flexibility.10 The Climate Group study11 suggests that the widespread adoption of Smart Grid technologies could reduce global emissions by 2.03 gigatonnes (Gt) CO2e (carbon-dioxide equivalent is a quantity that describes, for a given mixture and amount of greenhouse gas, the amount of CO2 that would have the same global warming potential, when measured over a specified timescale [generally, 100 years]),1 worth €79 billion ($124.6 billion). The Information and Communications Technology (ICT) sector is uniquely placed to partner with power companies to optimize the existing electricity grid to allow more efficient power distribution and enable more renewable or green power. The remainder of this paper is organized as follows: The “CO2 emmisions” section discusses recent data on CO2 emissions and presents possible steps that are foreseen to retain climate changes within a certain limit. The “Overview of smart power grid” section gives an overview of the Smart Grid, while the “How can Smart Grid reduce CO2 emissions” section presents possible means by which Smart Grid can contribute to reducing pollution and increasing energy efficiency. The “How can nanotechnology reduce CO2 emission” section is dedicated to advances in nanotechnology from the prospective of reducing CO2 emission. We conclude with a view of recent progress which confirms that Smart Grid can become an integral part of future clean energy solutions. Economic development involves the increased use of highly energy intensive materials, such as steel, cement, glass, and aluminum. These materials are necessary for the construction and development of transport, energy, housing, and water management infrastructure. Coal is the most widely used source of energy in energy-intensive industries and is important in the development of modern infrastructure in growing economies.12 According to the United States Greenhouse Gas Inventory (2006), the top five sources of CO2 emissions are: fossil fuel (coal, oil, and natural gas) combustion, non-energy use of fuels (construction of modern infrastructure such as transport), iron and steel production, cement manufacturing, and natural gas systems.13 Coal generates the most CO2 emissions of any fossil fuel and yet remains the world’s dominant energy source. On May 9, 2013, the Earth’s atmosphere crossed an alarming threshold, when the concentration of CO2 in the atmosphere reached 400 parts per million (ppm), up from 355 ppm in 1990,14 Figure 1. 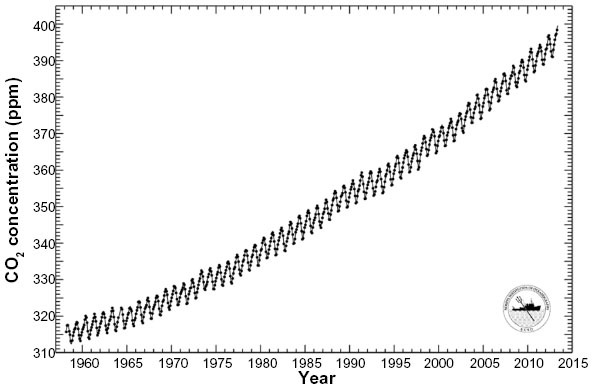 Figure 1 Monthly average carbon dioxide concentration: Mauna Loa Observatory, Hawaii. Figure 2 Global CO2 emissions per region from fossil-fuel use and cement production. Abbreviations: OECD, Organization for Economic Co-operation and Development; EDGAR, Emission Database for Global Atmospheric Research; JRC, European Commission’s Joint Research Centre; PBL, the Netherlands Environmental Assessment Agency; BP, British Petroleum; NBS People’s Republic of China, National Bureau of Statistics People’s Republic of China; USGS, US Geological Survey; WSA, World Steel Association; NOAA, National Oceanic and Atmospheric Administration. atmospheric CO2 levels increased in 2012 at a faster rate than the average over the past 10 years. impossibility of storing: electricity cannot be economically stored using commercially available technology today, so it must be generated, delivered, and consumed at the moment that it’s needed by end-use customers. Thus, maintaining a reliable electric power grid requires real-time balancing of supply and demand. applications layer refers to applications that can be installed once the Smart Grid infrastructure and communications layer is in place. Some examples of applications are demand response programs and self-healing algorithms. These allow for shifting of load during peak hours and self-maintenance of the electric grid, which provides better reliability of power. 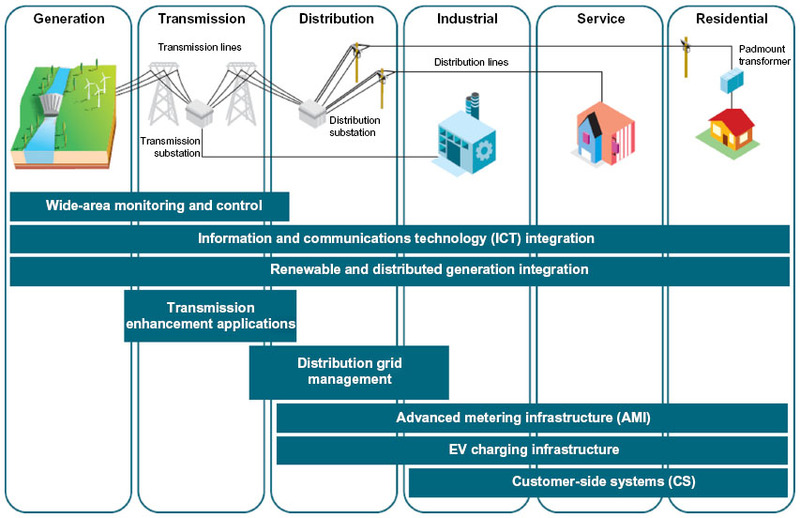 Rather than replacing existing infrastructures, new smart capabilities are made possible by integrating new applications into transmission and distribution grids.21 While the task of the existing energy infrastructure – to deliver energy – remains unchanged in a Smart Grid, communication between the consumer and provider will be much more efficient and effective, and therefore less expensive and more reliable. The document Framework and Roadmap for future Smart Grids,22 by National Institute of Standards and Technology (NIST) identifies seven domains within the Smart Grid – transmission, distribution, operations, bulk generation, markets, customer, and service provider. A Smart Grid domain is a high-level grouping of organizations, buildings, individuals, systems, devices, or other actors with similar objectives and relying on, or participating in similar types of applications. Across the seven domains, numerous actors will capture, transmit, store, edit, and process the information necessary for Smart Grid applications. In Release 3.0, Smart Grids are seen from the perspective of hybridized systems that combine computer-based communication, control, and command with physical equipment to yield improved performance, reliability, resiliency, and user and producer awareness. secure information processing flows (collecting, processing, and distribution). 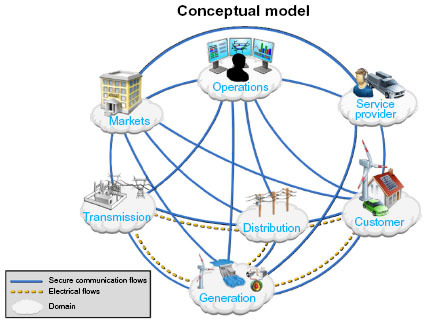 Figure 3 shows the conceptual model with key linkages across entities that will comprise the Smart Grid. Figure 3 Interaction of roles in different Smart Grid domains through secure communication. Abbreviation: NIST, National Institute of Standards and Technology. renewable and distributed generation integration: require connecting solar arrays, wind farms and other sources to power grids. This involves new products in addition to standard technologies used to connect traditional sources such as coal and nuclear. Some of the technologies from Figure 4 are actively being deployed and are considered mature in both their development and application, while others require further development and demonstration. A fully optimized electricity system will deploy all the technology areas from Figure 4. However, not all technology areas need to be installed to increase the “smartness” of the grid. Figure 4 Smart Grid technology areas. Abbreviations: EV, electric vehicle; NETL, US National Energy Technology Laboratory; NIST, National Institute of Standards and Technology. How can Smart Grid reduce CO2 emissions? Pacific Northwest National Laboratory’s report25 provides an assessment of nine mechanisms by which the Smart Grid can reduce energy use and carbon impacts associated with electricity generation and delivery. The mechanisms and their impacts – a reduction in electricity use and CO2 emissions by 2030 – are analyzed in Table 1. The impacts can be divided into direct and indirect reductions: direct reductions are Smart Grid functions that themselves produce savings in energy and/or emissions consumed or by reducing generation requirements; indirect reductions are related to Smart Grid functions producing cost savings. Smart grids are also about enabling users to improve their power usage profile and make it smarter, reducing power consumption when energy is scarcely available while allowing higher consumption when there is more on offer. Depending on the time of equipment use, energy efficiency measures can produce significant reductions in peak demand. Potential actions by which Smart Grid technology can contribute to energy savings are conservation effect of consumer information and feedback systems, deployment of diagnostics in residential and small/medium commercial buildings, support for EVs, and advanced voltage control. According to a report,34 M2M-enabled Smart Grid is a significant contributor to the reduction of greenhouse gases. M2M has the potential to enable efficiency gains throughout the global economy that could reduce greenhouse gas emissions by 9.1 Gt CO2e by 2020. This is a remarkable figure because the International Energy Agency estimates that the world needs to reduce greenhouse gas emissions by 5–7 Gt CO2e by 2020 in order to meet the global temperature increase goal of no more than 2°C. Shades of Green report37 compares the carbon emissions of electric cars in twenty of the world’s leading countries and highlights that EVs must be used in tandem with low carbon power in order to maximize carbon emission reductions. In countries with coal dominated power supplies electric cars generate carbon emissions four times higher than in places with low-carbon electricity. Solar photovoltaic power is a commercially available and reliable technology with a significant potential for long-term growth in nearly all world regions. The roadmap39 estimates that by 2050, photovoltaic cells will provide around 11% of global electricity production and avoid 2.3 Gt of CO2 emissions per year. Wind power is also very effective at cutting CO2 emissions, as demonstrated by researchers from Universidad Politecnica de Madrid, Spain, in the report.40 This study generated the first comprehensive analysis of the interaction between wind parks and thermal power plants in Spain and has concluded that global balance of CO2 reduction is significant. The roadmap41 targets 15% to 18% share of global electricity from wind power by 2050, a notable increase from the 12% aim for 2009. The new target of 2,300 GW to 2,800 GW of installed wind capacity will avoid the emission of up to 4.8 Gt of CO2 annually. How can nanotechnology reduce CO2 emission? Nanotechnology is a platform whereby matter is manipulated at the atomic level. There are various ways that nanotechnology can be applied along the Smart Grid to help reduce CO2 emissions. nanotechnology could play a major role in the next generation of batteries. For example, coating the surface of an electrode with nanoparticles increases the surface area, thereby allowing more current to flow between the electrode and the chemicals inside the battery. Such techniques could increase the efficiency of electric and hybrid vehicles by significantly reducing the weight of the batteries. Moreover, superior batteries would complement renewables by storing energy economically, thus offsetting the whole issue of intermittent generation. This review demonstrates the potential for reduction of CO2 emissions that Smart Grids can potentially achieve. Power grid modernization is an evolution that will continue for years or decades, and providing a robust foundation for new applications and technologies is imperative. The electric power industry is facing tremendous opportunities and becoming increasingly important in the emerging low-carbon economy. Governments are still dominant players in high-cost smart-grid investments. This suggests the need for a policy framework that attracts private capital investment, especially from renewable project developers, and communication and ICT companies. The challenge we face is neither a technical nor policy one – it is political: the current pace of action is simply insufficient. The technologies to reduce emission levels to a level consistent with the 2°C target are available and we know which policies we can use to deploy them. However, the political will to do so remains weak. This lack of political will comes with a price: we will have to undertake steeper and more costly actions to potentially bridge the emissions gap by 2020.4 However, technical possibilities aside, the key to reducing emission levels will be the tough but unavoidable decision that reducing carbon pollution must be of the highest priority. This work has been supported by the Serbian Ministry of Education and Science (project no III44006). Harter G, Sinha J, Sharma A, Dave S. Sustainable urbanization: the role of ICT in city development. Booz and Company; 2010. Available from: http://www.strategyand.pwc.com/global/home/what-we-think/reports-white-papers/article-display/sustainable-urbanization-role-city-development. Accessed August 25, 2014. Giraud PN, Benard M, Lefèvre B, et al. Energy and Urban Innovation. World Energy Council 2010. Available from: http://www.worldenergy.org/wp-content/uploads/2012/10/PUB_Energy_and_urban_innovation_2010_WEC.pdf. Accessed September 16, 2014.
worldenergy.org [homepage on the Internet]. World Energy Scenarios: Composing energy futures to 2050. World Energy Council; Paul Scherrer Institute (PSI), Switzerland. Available from: http://www.worldenergy.org/work-programme/strategic-insight/global-energy-scenarios/. Accessed August 25, 2014. United Nations Environment Programme (UNEP). The Emissions Gap Report 2013. United Nations Environment Programme (UNEP), Nairobi; 2013. Available from: http://www.unep.org/emissionsgapreport2013/. Accessed March 5, 2014. ScienceDaily [homepage on the Internet]. Key links between consumption, climate change. University College London – UCL; November 14, 2013. Available from: http://www.sciencedaily.com/releases/2013/11/131114193245.htm. Accessed March 5, 2014. Climate Policy Watcher [homepage on the Internet]. The Impact of Climate Change on Electricity Demand: Developing vs Developed Countries; August 27, 2013. Isabella Alloisio. Available from: http://www.climate-policy-watcher.org/?q=node/546. Accessed March 5, 2014.
energy.gov [homepage on the Internet]. US Department of Energy. Energy Efficiency. Available from: http://www.energy.gov/science-innovation/energy-efficiency. Accessed January 15, 2014. Hirst E, Brown MA. Closing the Efficiency Gap: Barriers to the Efficient Use of Energy. Resources, Conservation and Recycling. 1990;3(4):267–281. nanowerk.com [homepage on the Internet]. Nanotechnologies to mitigate global warming, nanowerk; May 04, 2010. Available from: http://www.nanowerk.com/spotlight/spotid=16126.php. Accessed March 10, 2014.
switchboard.nrdc.org [homepage on the Internet]. Connecting the Dots Between the Smart Grid and Sustainability; 2012. Available from: http://switchboard.nrdc.org/blogs/ssuccar/connecting_the_dots_between_th_1.html. Accessed January 15, 2014.
gesi.org [homepage on the Internet]. The Climate Group on behalf of the Global eSustainability Initiative (GeSI), SMART 2020. Enabling the Low Carbon Economy in the Information Age; 2008. Available from: http://gesi.org/files/Reports/Smart%202020%20report%20in%20English.pdf. Accessed January 15, 2014. World Coal Association, Coal Matters. Coal and Modern Infrastructure; 2013. Available from: http://www.worldcoal.org/bin/pdf/original_pdf_file/coal_matters_4_-_coal_and_modern_infrastructure(01_05_2013).pdf. Accessed January 15, 2014.
iso.org [homepage on the Internet]. Mitigating climate change, ISO Focus+ June 2012. Available from: http://www.iso.org/iso/livelinkgetfile-isocs?nodeId=16099494. Accessed February 12, 2014. PBL Netherlands Environmental Assessment Agency. Oliver JG, Janssens-Maenhout G, Muntean M, Peters JA. Trends in Global CO2 Emissions; 2013 Report. The Hague: PBL Netherlands Environmental Assessment Agency; Ispra: Joint Research Centre. http://www.pbl.nl/en. Accessed May, 2014. Abdallah L, El-Shennawy T. Reducing Carbon Dioxide Emissions from Electricity Sector Using Smart Electric Grid Applications. Journal of Engineering. 2013;13(845051). Meinshausen M, Meinshausen N, Hare W, et al. Greenhouse-gas emission targets for limiting global warming to 2°C. Nature. 1990;458:1158–1162. globalcarbonproject.org [homepage on the Internet]. Global Carbon Budget; Nov 2013. Available from: http://www.globalcarbonproject.org/carbonbudget/13/hl-full.htm. Accessed January 20, 2014.
spiegel.de [homepage on the Internet]. Green Revolution? German Brown Coal Power Output Hits New High; January 07, 2014. Available from: http://www.spiegel.de/international/germany/researchers-alarmed-at-rise-in-german-brown-coal-power-output-a-942216.html. Accessed January 20, 2014.
International Energy Agency. CO2 Emissions from Fuel Combustion, 2013. Available from: http://www.iea.org/publications/freepublications/publication/CO2EmissionsFromFuelCombustionHighlights2013.pdf. Accessed March 1, 2014. Mack Institute Wharton University of Pennsylvania. The Smart Grid – A World of Emerging Technologies. Analysis of Home Area Networks; Jul 2011. Available from: http://mackinstitute.wharton.upenn.edu/wp-content/uploads/2013/01/Ruth-Lin-The-Smart-Grid.pdf. Accessed March 1, 2014.
ibm.com [homepage on the Internet]. IBM Software, Power your smart grid transformation with IBM Rational software; 2010. Available from: http://public.dhe.ibm.com/common/ssi/ecm/en/ras14060usen/RAS14060USEN.PDF. Accessed March 1, 2014. National Institute of Standards and Technology. NIST Special Publication 1108R2, NIST Framework and Roadmap for Smart Grid Interoperability Standards, Release 2.0; 2012. Available from: http://www.nist.gov/smartgrid/upload/NIST_Framework_Release_2-0_corr.pdf. Accessed January 10, 2014.
geospatial.blogs.com [homepage on the Internet]. NIST Framework and Roadmap for Smart Grid Interoperability Standards 3.0 to be released for public comment; November 08, 2013. Available from: http://geospatial.blogs.com/geospatial/2013/11/nist-framework-and-roadmap-for-smart-grid-interoperability-standards-30-to-be-released-for-public-co.html. Accessed March 10, 2014. Center on Globalization, Governance and Competitiveness Duke University. Core Firms in the Research Triangle Region, NC; 2011. Available from: http://www.cggc.duke.edu/pdfs/Lowe_Research-Triangle-Smart-Grid_CGGC_05-24-2011.pdf. Accessed January 15, 2014. Pacific Northwest National Laboratory. 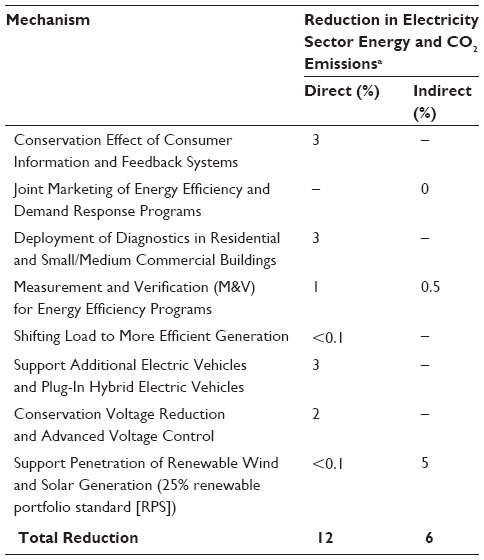 The Smart Grid: An Estimation of the Energy and CO2 Benefits Revision 1; Jan 2010. Available from: http://energyenvironment.pnnl.gov/news/pdf/PNNL-19112_Revision_1_Final.pdf. Accessed February 22, 2014. Markovic DS, Zivkovic D, Branovic I, Popovic R, Cvetkovic D. Smart power grid and cloud computing. In: Kazmerski L, editor. Renewable and Sustainable Energy Reviews. Philadelphia: Elsevier; 2013;24:566–577. Hong T, Fan S. Special Section on Analytics for Energy Forecasting with Applications to Smart Grid. Smart Grid, IEEE Transactions on. 2014;5(1):399–401. Noja Power. Carbon Emission Reductions by the Implementation of a Smart Grid; 2013. Available from: http://www.nojapower.com/dl/library/carbon-emission-reductions-by-the-implementation-of-a-smart-grid.pdf. Accessed January 27, 2014. TIBCO Spotfire’s Business Intelligence Blog. Using Analyticsto Better Manage Big Data from Smart Grids; February 6, 2013. Available from: http://spotfire.tibco.com/blog/?p=17429#sthash.K8VZLYlE.dpuf. Accessed January 27, 2014.
energerati.com [homepage on the Internet]. Data Analytics-The Cloud Killer App for the Smart Grid; February 7, 2014. Available from: http://www.engerati.com/article/data-analytics-cloud-killer-app-smart-grid. Accessed March 15, 2014. Doyle J, Shorten R, O’Mahony D. Stratus: Load Balancing the Cloud for Carbon Emissions Control. Cloud Computing, IEEE Transactions on. 2013;1(1):1.
phys.org [homepage on the Internet]. Deane T. New cloud computing system can reduce carbon emissions; January 15, 2014. Available from: http://phys.org/news/2014-01-cloud-carbon-emissions.html. Accessed January 27, 2014.
yourenergyblog.com [homepage on the Internet]. Kennedy J. M2M: smartening up the grid; April 24, 2013. Available from: http://www.yourenergyblog.com/m2m-smartening-up-the-grid/. Accessed March 10, 2014. Carbon War Room Research Report. Machine to Machine Technologies: Unlocking the Potential of a $1 Trillion Industry. Cullinen M; 2013. Available from: http://www.grahampeacedesignmail.com/cwr/cwr_m2m_down_singles.pdf. Accessed January 27, 2014. Helmers E, Marx P. Electric cars: technical characteristics and environmental impacts. Environmental Sciences Europe. 2012;24:14. Silver Spring Networks. How the Smart Grid Enables Utilities to Integrate Electric Vehicles, White Paper. Available from: http://www.silverspringnet.com/pdfs/whitepapers/SilverSpring-Whitepaper-ElectricVehicles.pdf. Accessed February 22, 2014. Shrink that footprint. Wilson L. Shades of Green: Electric Cars’ Carbon Emissions Around the Globe; 2013. Available from: http://shrinkthatfootprint.com/wp-content/uploads/2013/02/Shades-of-Green-Full-Report.pdf. Accessed March 10, 2014. European Commission, DG ENER Working Paper. The Future Role and Challenges of Energy Storage. Available from: http://ec.europa.eu/energy/infrastructure/doc/energy-storage/2013/energy_storage.pdf. Accessed March 10, 2014.
International Energy Agency. Technology Roadmap Solar Photovoltaic Energy, 2010. Committee on Energy Research and Technology. Available from: https://www.iea.org/publications/freepublications/publication/pv_roadmap.pdf. Accessed March 10, 2014.
cleantechnica.com [homepage on the Internet]. Zachary Shahan. Wind Power Cuts CO2 Emissions Considerably, Even At High Penetration Levels; 2013. Available from: http://cleantechnica.com/2013/10/21/wind-power-cuts-co2-emissions-considerably-even-high-penetration-levels/#YWjdKeKDJzWysdQK.99. Accessed March 10, 2014.
International Energy Agency. Wind Energy Roadmap, 2013 Edition. Available from: http://www.iea.org/media/freepublications/technologyroadmaps/foldout/WIND_Foldout.pdf. Accessed March 10, 2014.
alphagalileo.org [homepage on the Internet]. Universidad Politécnica de Madrid, Intermittence of wind energy hardly affects CO2 emissions in Spain; 2013. Available from: http://www.alphagalileo.org/ViewItem.aspx?ItemId=135408&CultureCode=en. Accessed March 10, 2014. Erickson RW, Maksimovic D. Fundamentals of Power Electronics. 2nd ed. Springer, 2001.
energy.gov [homepage on the Internet]. US Department of Energy. Power electronics. Available from: http://energy.gov/oe/technology-development/power-electronics. Accessed January 15, 2014. Fuji Electric Global. Power Electronics Technology that Supports Smart Grid. Fuji Electric Review, vol 57 no 4; 2011. Available from: http://www.fujielectric.com/company/tech/pdf/57-04/FER-57-4-000-2011.pdf. Accessed March 10, 2014.
smartgridnews.com [homepage on the Internet]. Transmission is getting smarter with advanced power electronics; 2010. SmartGridNews. Available from: http://www.smartgridnews.com/artman/publish/Technologies_Transmission/Transmission-is-getting-smarter-with-advanced-power-electronics-3189.html#.Uy224_ldUlc. Accessed March 10, 2014. Computer Science and Artificial Intelligence Laboratory. Kinsy MA, Celanovic I, Khan O, Devadas S. MARTHA: Architecture for Control and Emulation of Power Electronics and Smart Grid Systems. Available from: http://people.csail.mit.edu/devadas/pubs/martha-date13.pdf. Kroposki B, Pink C, DeBlasio R, et al. Benefits of Power Electronic Interfaces for Distributed Energy Systems. Power Engineering Society General Meeting, Montreal, Que 2006. IEEE. Cientifica. Quantifying The Effect of Nanotechnologies on CO2 Emissions. Cientifica; 2007. Available from: http://www.cientifica.com/WhitePapers/052_CO2QuantificationWhitePaper.pdf. Accessed March 10, 2014. Lufthansa Cargo. Cargo Climate Information. Lufthansa Cargo; 2013. Available from: http://lufthansa-cargo.com/fileadmin/user_upload/corporate_2013/pdf/Environment/en/1.einlege r_en_final_mit_schutz_.pdf. Accessed March 15, 2014.
cerionadvancedmaterials.com [homepage on the Internet]. Energenics Announces Enercat Fuel Additive Trial Success; 2009. Available from: http://www.cerionenterprises.com/news_articles_/energenics_trial_success_.html. Accessed August 26, 2014. Verband der Chemischen Industrie eV. German Chemical Industry Association, Saving Energy with Nanotechnology. Verband der Chemischen Industrie eV; 2012. Available from: https://www.vci.de/Downloads/Publikation/Saving%20energy%20with%20nanotechnology.pdf. Accessed March 15, 2014.
horizons.gc.ca [homepage on the Internet]. When Energy Technology Goes on Steroids: The Nano-Energy Interface. [updated January 31, 2014]. Available from: http://www.horizons.gc.ca/eng/content/when-energy-technology-goes-steroids. Accessed March 15, 2014.
intelligentutility.com [homepage on the Internet]. Nanotechnology set to revolutionize smart grid evolution. Intelligent Utility; January 30, 2013. Available from: http://www.intelligentutility.com/article/13/01/nanotechnology-set-revolutionize-smart-grid-evolution. Accessed March 15, 2014. Earth System Research Laboratory. Global Monitoring Division. Scripps Institution of Oceanography. [webpage on the Internet]. US Department of Commerce. National Oceanic & Atmospheric Administration. NOAA Research. Available from: http://www.esrl.noaa.gov/gmd/ccgg/trends/index.html#mlo_data. Accessed September 16, 2014. Global CO2 emissions per region from fossil-fuel use and cement production. [webpage on the Internet]. PBL Netherlands Environmental Assessment Agency. Available from: http://www.pbl.nl/en/infographic/global-co2-emissions-per-region-from-fossil-fuel-use-and-cement-production. Accessed September 16, 2014.